From the Mastiff Museum :6dance: - This Forum is brought to you by The Mastiff Sweet Spot and Friends of the Forum. Derek, I'm sure not the only one collecting Mastiff memorabilia and I encourage more to follow suit, as it can be very rewarding on many levels. I have an open invitation to all who wish to visit the Mastiff Museum. Hope you can see it when you get to the States. Feel free to use anything I post, as far as I'm concerned, it is part of the internet eminent domain. Steve is the bronze above attributed to anyone ? I just purchased it and have not removed the bronze from it's plinth in order to check for casting marks etc. It is unmarked on the surface, but I believe it could be Christophe Fratin, or after Fratin. Wood engraving after H. Leutemann, 1875. Regarding the prior posting....... Either Clovis Viard, or his son Julien worked on this piece. Since the Viards were known for their sculptures and more recently, their glass perfume bottles, one can only assume this casting was done by Clovis, since he worked for the foundry below before setting out on his own. The F. Barbedienne foundry was started in Paris in 1838 by Ferdinand Barbedienne and Achille Collas, who was the inventor of a machine that would mechanically reduce statues. They at first produced bronze reductions of antique sculptures of Greek and Roman origin. Their first contract to produce bronzes modeled by a living artist was made in 1843 when they arranged to produce the works of Francois Rude. They barely survived the revolution and financial collapse of 1848 which caused many artists and foundries to declare bankruptcy. Barbedienne actively pursued contracts with the many sculptors of Paris contracting with David D'Angers, Jean-Baptiste Clesinger, and even producing some casts for Antoine Louis Barye as well as others. Barbedienne Purchased 125 casting models from the late Antoine Louis Barye's sale in 1876. He set about casting and selling editions of these sculptures which was very successful, devoting an entire catalogue to these works. Ferdinand Barbedienne died on March 21 1891 and was mourned by many in the world of sculpture. It was said that he strove to the highest quality in his castings Albert Susse said of him that he was the "pride of the nation" and that that he "carried the splendor of our industry so loftily to all international competitions". The running of the foundry was taken over by Gustave Leblanc, a nephew, and continued the high standards set by M. Barbedienne. The foundry set up agencies in Germany, Britain, and the United States to market their production. Leblanc actively purchased models and production rights form sculptors including Auguste Rodin and the estates of sculptures including Emmanuel Fremiet. The foundry continued under the stewardship of M. Leblanc until 1952. “Around 1918, sculptor Clovis Viard opened a major workshop specializing in glass creations at 25 rue Chevalier-Desire, Montreuil (Seine). Previously, Clovia Viard worked for the Barbedienne foundry and was awarded a gold medal in 1900. His son, Julien-Henri, was also a sculptor and exhibited his wares from 1900-1908 at Societe des Artistes Francais in the decorative arts section and received many prizes, such as the prestigious Prix de Rome in 1907. His business associate was Viollet Le Duc. After Clovis Viard’s death in 1927, Julien continued runing the workshop and in 1938, the company merged with its primary producer, Depinoix. Some of Viard’s clients included the perfume houses of Isabey, Gabilla, Lubin, Gueldy, Sauze and Ramses. Various glassworks such as Baccarat, Depinoix, Maugenest, Pochet et du Courval, Bobin, Societe Parisienne de Verreries all produced Viard models, then returned them to Viard for finishing, this included surface recutting, polishing, enamels, gilding, patinas, and stopper adjustments. There is a wide variation in quality of Viard signed models, as there were a range of producers, but the quality of the surface decoration was always of the highest excellence. The patina was mostly made up of organic watercolors and when applied to acid etched surfaces, it facilitated the absorption, and produced a subtle transparency. The choice of surface colors was determined by the perfume color and enhanced the presentation. Viard produced moulds from drawings and many major glassworks commisioned productions of difficult moulds with intricate designs and application of surface decoration. Models varied from simple to elaborate with figural motifs such as stoppers with patina that recalled elements of the perfume’s name. The bottle with non-figural stoppers, were often small and had floral designs. 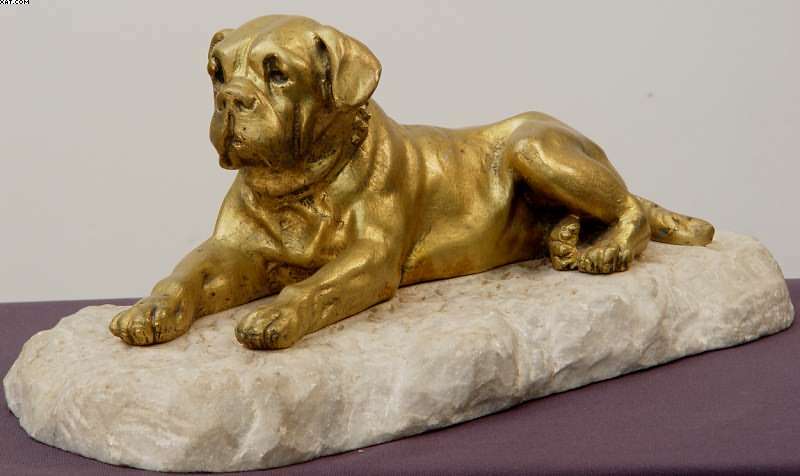 This popular reflection of a Mastiff in repose has been done by a number of other sculptors, all seeming to copy one another in general form. This primary image was first attributed to Valton, but I believe it is a mistake, as my meanderings have not encountered a Valton in this state, or anything close. In fact, this latest acquisition is one of the few, if any, signed by the maker. Gantrago Mercier gilt bronze signed. New acquisition. This is the sister piece to the bronze with a natural patina already in the Museum. I believe these two are the only two presently known to exist. The non gilt sister piece to the Mercier gilt bronze can be seen at left on the table. What a fantastic collection Steve - WOW! Only 5% of the actual collection Linda. The rest in display folders, which can only be accessed by a visit to the museum. Which BTW is open to all, just call for an appt. I am truly impressed.. hope someday to visit.. Artist and Engraver Guill T.Sas. Beautiful detail! Is this a plate intended to hang on the wall? It can be, or placed on a table. "As Ruben read, the burden seemed to fall from his shoulders"
I love this - look how the mastiff has his paw on his masters foot - so like them. I was watching that on eBay too Steve, glad you got it. Like Linda, it was the paw on the foot that got to me. Just a nice touch. I also like the way the woman is dressed for gardening. Just a tad overdone. This image was new to me, so I picked it up. In the 70's I would have been astonished to see what is presently known about collectible Mastiff stuff. Strange how spartan things can be in one moment of time and how abundant in the next! 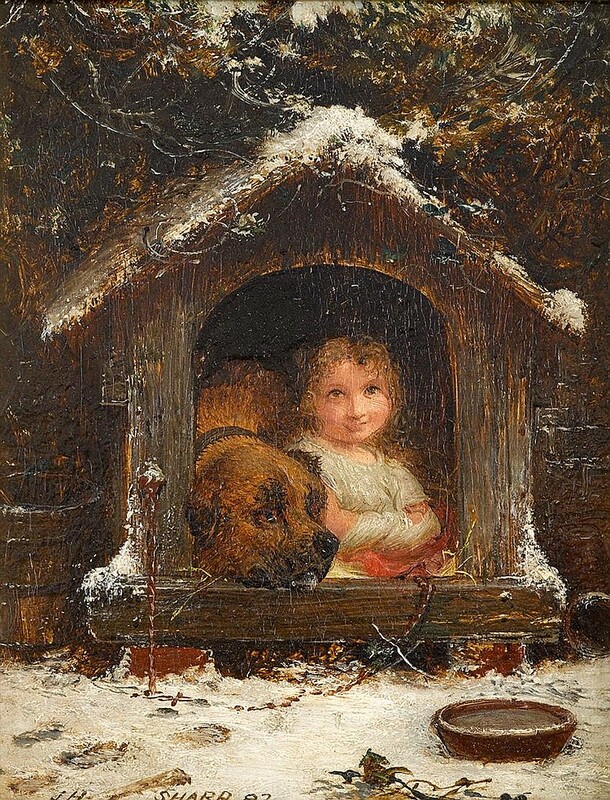 I'm still in touch with the auction house regarding the Gilpin. They have been dragging their sophisticated feet at Sotheby's. It's a wonder how they continue to stay afloat. 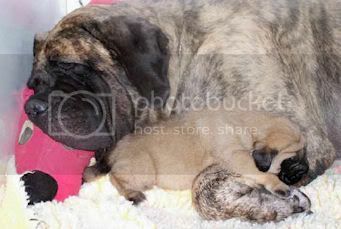 I know, when I started with Mastiffs it was so hard to find anything at all. Now, there is so much and most of it is so tempting. But I am glad I was there when the books were first published and easy to get etc. The internet has opened up so much. I have picked up some lovely pieces myself in the past few months and my Mastiff room has been expanded lol. It would be fantastic if you got the Gilpin. If I win the lotto I will give you a run for it. The mastiff appears to be the only one chained up, but at least he/she has the water. But the Bloodhound is eyeballing it! It's probably just thirsty. Plenty of smaller snacks within reach. Sampson, the missing champion mastiff Only Trophy and Empty Kennel Remain After Theft of 'Top' Dog -- Last Sunday, when her 2-year-old male English mastiff took best of breed at the Heart of America Kennel Club show here, Mrs. Edward Funk was happy and proud as any dog owner could be. Today, she has only a trophy and empty kennel where Sampson, her champion 210-pound mastiff, lived. He was stolen Tuesday between noon, when Dr. and Mrs. Funk drove away to run errands, and 4 p.m., when they returned. "I worked so hard to get a nice big male and I had one and now he's I gone," Mrs. Funk said. . Photo is 5” x 5.5” in size. He was stolen? How awful..